This rollator is a walker with a seat for elders who require balance support as well as a place to sit down confortably anywhere. Especially useful when going for walks in safe places like malls and gated communities. The modern design and sturdy construction of the Comodita Prima Special Rolling Walker make it one of the safest walkers on the market. The exclusive 16" wide orthopedic seat makes it ultra comfortable, ideal for users that enjoy resting between walks. 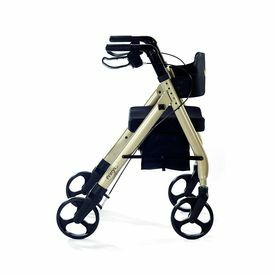 Built to support weights of up to 400 lbs (182 kgs), it is tested and approved under the most demanding standards for rolling walkers. Our signature "S" shaped back wheel support provides extra space for the feet to move, helping to avoid tripping and falling. It also allows the weight to be placed right above the wheels, and not on the side of the wheels like most models on the market. Our rolling walker is built with the best materials available to ensure the highest safety you can find. This rollator is a walker with a seat for elders who require balance support as well as a place to sit down confortably anywhere. Especially useful when going for walks in safe places like malls and gated communities. The modern design and sturdy construction of the Comodita Prima Special Rolling Walker make it one of the safest walkers on the market. The exclusive 16" wide orthopedic seat makes it ultra comfortable, ideal for users that enjoy resting between walks. Built to support weights of up to 400 lbs (182 kgs), it is tested and approved under the most demanding standards for rolling walkers. Our signature "S" shaped back wheel support provides extra space for the feet to move, helping to avoid tripping and falling. It also allows the weight to be placed right above the wheels, and not on the side of the wheels like most models on the market. 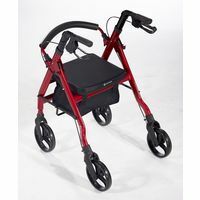 Our rolling walker is built with the best materials available to ensure the highest safety you can find.